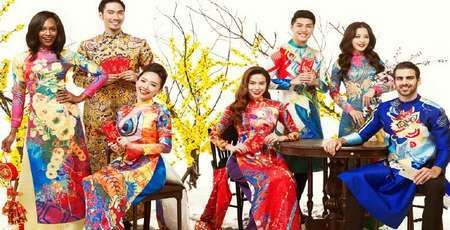 Since thousands of years, Tet – the Lunar New Year of Vietnam has been considered as one of the most important event in the year of each family. Tet is not only a joyful occasion for family reunion but also a chance for Vietnamese people to express their gratefulness to deities and ancestors. Owing to the 1000 years of Chinese colonisation, it is usually misunderstood that the Vietnamese Tet has its origin from China. Nevertheless, in fact, before being controlled by the Chinese, we had already had our own civilisation since the beginning of our establishment. During the regime of Van Lang – Au Lac, An Duong Vuong had built up the ground of Vietnamese culture, including Tet as a celebration for new year occasion. 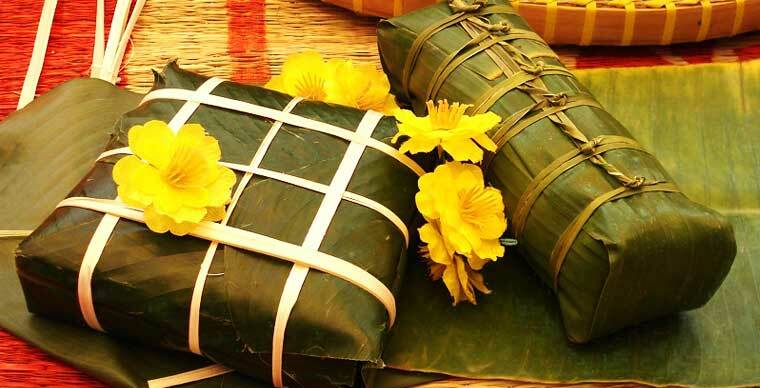 As written in the tale “Banh chung banh day” – the symbol of “Round Sky – Square Land”, it has been believed that Tet occasion has its origin in Vietnam. Lunar Calendar bases on observation of the lunar cycle, therefore, Tet usually comes after the normal western new year (1/1). 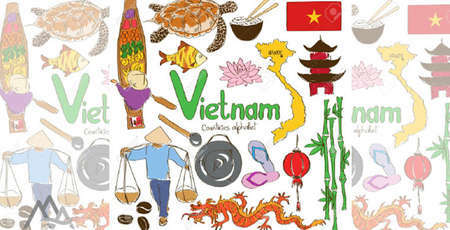 Tet is often celebrated in Vietnam between the end of February and the begin of February, lasting from the 23rd of December to the 7th of January in the Lunar Calendar. Tet is an occasion for family reunion and new commencement and therefore, it is full of hope and optimism. 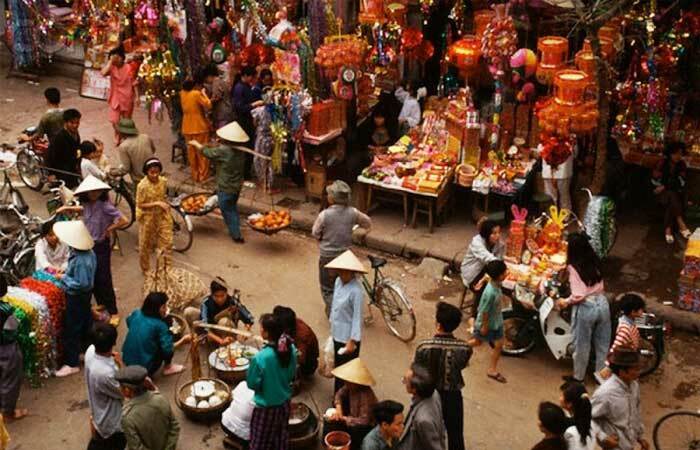 Depending on each region or different religions in Vietnam, the celebration of Tet can be varied. However, in general, Tet can be devided into 3 periods: “Tất niên” – Before New Year’s Eve, “Giao thừa” – New Year’s Eve and “Tân niên” – the New Year. Each period corresponds to different preparation, ritual and custom. On December 23rd (Lunar Calendar), Vietnamese families will clean their kitchen to prepare for the farewell ceremony for the Kitchen Gods. According to traditional rituals, some gold-fishes will be released to bring the Kitchen Gods to the Paradise, hopefully the Kitchen Gods will report positively to the Jade Emperor what happened in the family kitchen within one year. Cleaning house before Tet is meant to say goodbye to the bad things happened during the year and welcome a whole new year hopefully with luck and success. In this occasion, all the furniture and household stuffs will be cleaned. New decoration will be displayed, and new bowls will be used. Besides, Vietnamese people will try to return all their debts because it is believed that debts will bring bad lucks and risks for the new year. 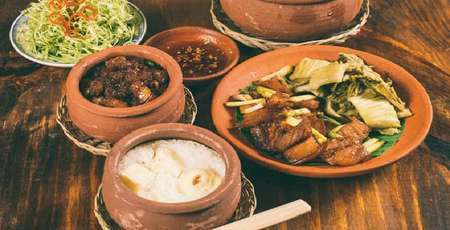 Besides buying necessary ingredients for preparing food during Tet, such as la phrynium leave, fatty pork specks and pickleed welsh onion. to make banh chung (sticky rice cake) and participate in the New Year Eve’s ceremony. 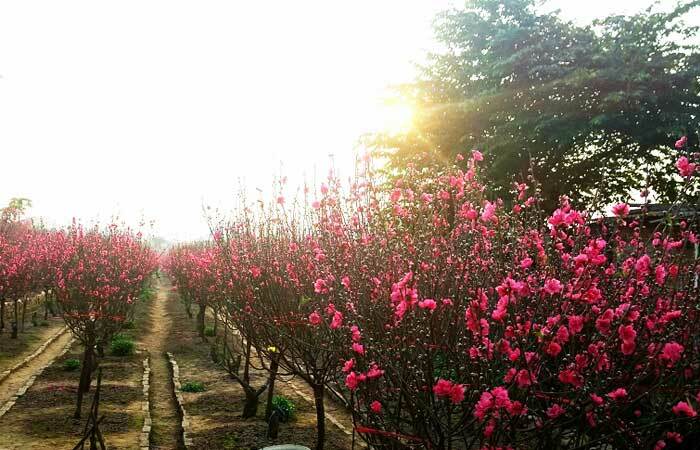 Peach, appricot blossom, amplexicaul tea, sword lily and dahlia are favored for decoration during Tet holiday as they represent the symbol of prosperty, peace and luck. Having a new callighraphy picture is another popular activity of Vietnamese people during Tet holiday. This can a word or a phrase that represents their wishes. The most favorite words are Moral, Happiness, Thetics, Peace and Luck. Before Tet, family members reunite and together visit and take care of their ancestors’ tombs. Each family brings along incense sticks, fruits to honour their ancestor spirits. Besides, it is also a chance for family members to recall the remarked memories of the year and hope for a new year with positivity. Making chung cake is a custom existing from the Hung Vuong 18th civilisation. Usually on the December 28th and 29th in the Lunar Calendar, family members will make chung cake and tet cake together to eat during the holiday or gift to their friends and relatives. It requires a set of good skills and techniques to make beautiful and delicious rice cakes. If a cake is not made carefully or covered properly, it may be broken or become too soft. The New Year’s Eve ceremony includes 2 sessions: one inside and one outsite. 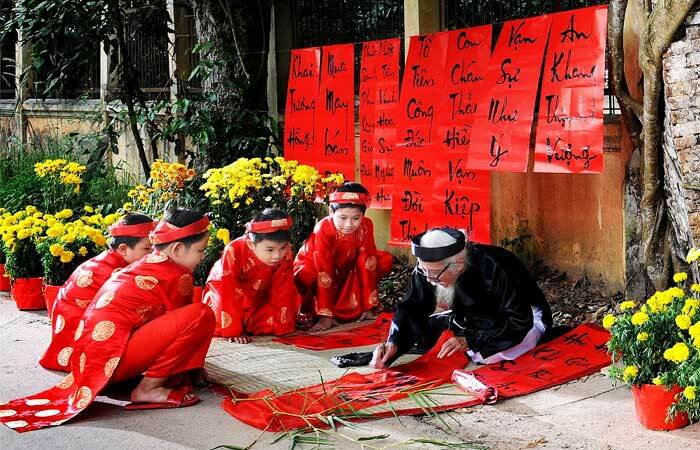 Vietnamese people undertaking this ceremony with the belief that each year has its beginning and ending. The ceremony also means to remove all the resentment and welcome a new year with blessing and luck. 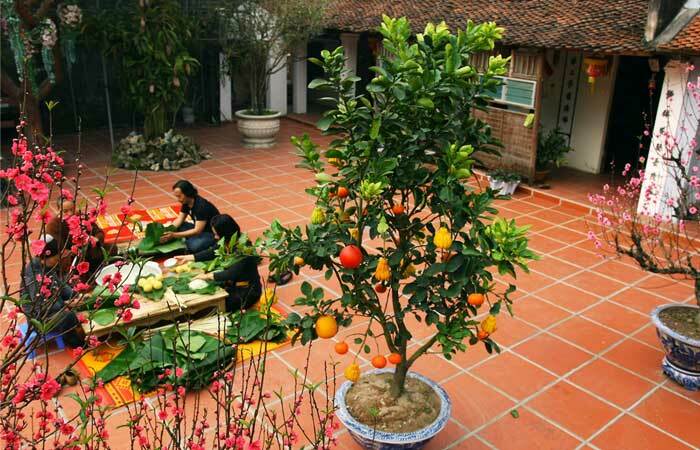 After the New Year’s Eve ceremony, Vietnamese people will choose a propitious hour to go out and pick buds or young leaves with the hope that there will be a lot of luck and satisfaction for the new year. To Vietnamese people, visiting pagodas during Tet holiday is not only to express their wishes but also to find peace after a hard and stressful year of working. With the calm and peaceful environment in pagodas, they hope to forget all the sadness and worries after the previous year and find peace for their souls. 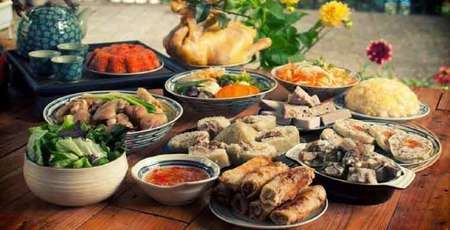 Vietnamese people believe that the first person who visiting their house after the Lunar New Year’s Eve ceremony will decide their destiny within one year, in terms of happiness, luck and prosperity. Therefore, they usually carefully choose the this person basing on their background and their age match. The first-foot must wear proper clothes and walk around the house with the hope that their actions will bring good luck to the family they are visiting. It can be considered that giving wishes during Tet holiday is an unique and indispensable cultural custom in Vietnam. When giving wishes, everyone will dress up with nice clothes, usually in red and bring along some gifts to the family that they visit. There is a saying for Vietnamese Tet holiday: “The first day of Tet is for father, the seconday is for mother and the thirday is for teachers. Father is for the representative of his family, mother is for the representative of her family and teachers are the representative of the people who teach and bring us knowledge. 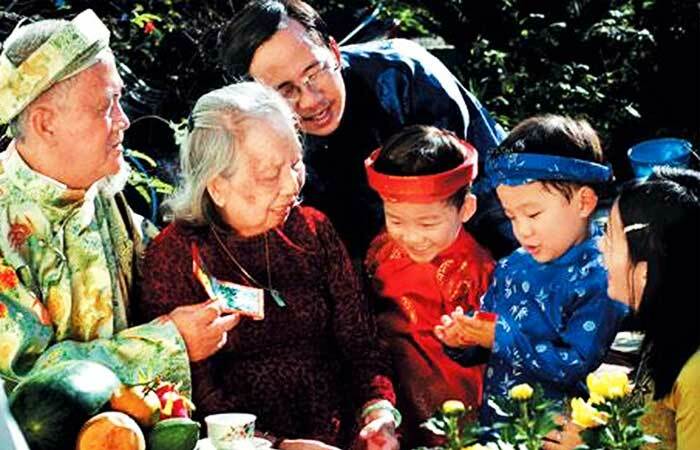 During Tet holiday, Vietnamese adults usually give lucky money to children with the wishes that they will always be happy, lucky and achieve good result in their study. Red envelopes symbolise the luck, happiness and prosperity. In Chinese culture, all the people who have not yet getting married will still can receive lucky money. Tet holiday is not just a ceremony but it represents the beauty in the soul of Vietnamese people as well as the Vietnamese culture.